Creative Creatures is an Australian owned scrapbook supplies business. We’re daring to be different by only stocking pet and animal related scrapping products. 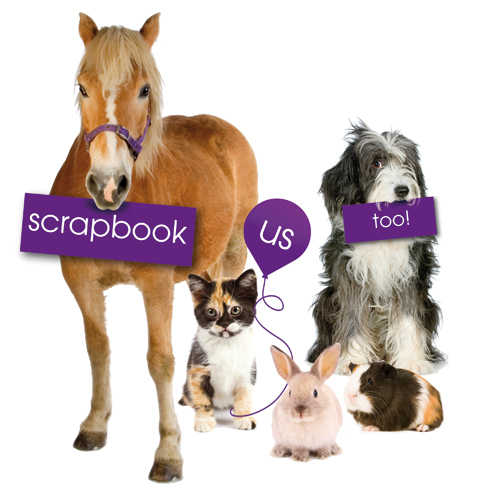 In fact our vision is to supply the largest range of animal related scrapbook supplies on the internet. The team behind Creative Creatures is made up of mum & daughters team: Ida (mum) and sisters Alison and Melissa. We are, first & foremost, devoted animal people- surrounded daily with literal herds of wonderful creatures – great and small. We’re not embarrassed to say it: they really do make each day worth living. Our large and photogenic group of friends currently includes horses, texas longhorn cattle, cats, dogs, a blue-tongue lizard, budgies, cockatiels, a poddy sheep and a very grumpy, one-person goat! Each animal has its own personality and there are always “moments”. You know the ones…they’re funny, happy, cute, proud and sometimes heartbreaking. As such, our digital memory cards are always full to overflowing. The natural solution, as you would understand, led us to our local scrapbook shops and others we conveniently passed by in our travels. Sadly, there were few animal related items to satisfy our insatiable need. This, we considered to be a serious issue, serious enough to start a business. Creative Creatures is addressing the problem, by bringing together a wide range of animal-themed scrapbook supplies. We’ve even designed our own range of scrapbook papers for pets around the sorts of photographs that animal people take…cuddles, baths and just hanging out. Oh yes, we have albums worth. And because we recognise that there’s a huge range of pet and animal friends, we’ve made it our mission to stock products for all different species. We’re aiming to create the biggest and best range of animal scrapping products on the web, and to provide you with a website that is really easy to use. Our goal is to inspire you to put your pets memories in an album alongside those of your family, friends, children, weddings, and travel. We welcome you to our site and hope you have a nice time looking around. Hope you find something you like.